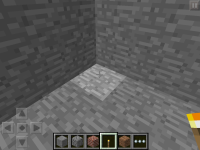 When you place a torch on the floor if there is a wall next to the floor block, the torch will go onto the wall. I expected the torch to place on the floor. The torch placed on the wall. 1. Build a tower 1 block wide and 2 blocks high. 4. Place a torch on the floor between the towers. 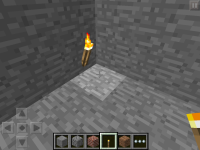 MCPE-1789 Placing torch on ground with wall next to it (maybe a roof directly above) will make torch place on wall. MCPE-1794 When you try to place a torch on top of a block and if there is a block next to it, the torch will be placed on the side of the block that was next to it. MCPE-1913 Sadly the torch bug... it goes to the right, or left of the wall when placed, when placed on the ground next to the wall, it appears on the wall. MCPE-2003 Whenever you place a torch on the left side, it goes to the right, and you can NEVER place it on the left.